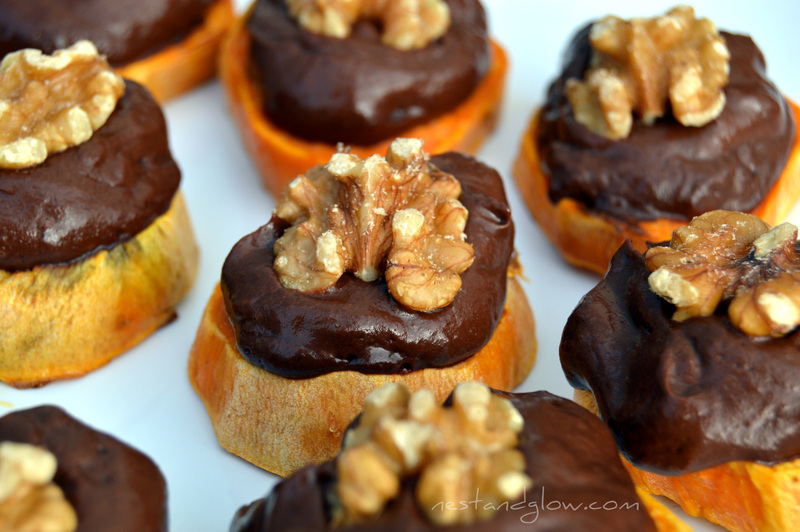 Bite size sweet potato with chocolate avocado frosting is a perfect healthy appetiser. Bursting with nutrition and healthy fats this healthy sweet potato snack is easy to love. Free of flour, gluten, dairy and refined sugar. Readers often tell me this is the perfect healthy Thanksgiving appetiser. These make a great healthy snack for a party or spread. The rich chocolate combines perfectly with avocado to make a silky smooth moose. It’s topped with either a walnut or pecan that complements the chocolate frosting. The colour of the bright orange with the dark chocolate makes these very attractive even to someone that isn’t a healthy eater. This is a recipe where it’s about 50% raw so perfect if you are trying to get more raw foods into your diet. The chocolate avocado mixture on its own is a staple that I often use for frosting or mousse. See my salted caramel chocolate avocado recipe. If I was ever to start a healthy catering company this would be a perfect dessert canape! Some were originally confused as to when to have this healthy chocolate avocado treat, my answer was simply anytime you want! These avocado chocolate bites are best served while still warm. As the sweet potatoes are oil free they can go a bit cardboardy if cooked and left overnight. If you are doing these in advance then I’d recommend brushing with cold pressed oil after cooking to help keep them moist. You can cook the sweet potato with oil but for health reasons I try to avoid heating oils as it destroys any goodness. If you do cook with oil choose one with a high smoke point like light olive oil or avocado oil as they are healthier to cook with. These chocolate sweet potatoes are great for a spread during the winter or autumn but you may want to add a bit of cayenne pepper or cinnamon to spice them up. Chocolate and chilli work amazingly well together as they stimulate nerve endings and release serotonin into the brain. If you don’t have any vegan plant based milk/mylk you can blend any nuts or seeds with water and sieve to make a milk. You could make it with just water for a darker and more bitter chocolate topping. I generally top these sweet potato chocolate treats with pecans or walnuts as the delicate nutty flavour works really well. However this is totally optional and if you want them nut free I recommend using some pumpkin or sunflower seeds as will add the required crunch. These healthy treats are the perfect mixture of a soft sweet base, silky chocolate and a crunchy topping. Some people are instantly put off by the idea of chocolate and avocado together even though you really can’t taste it. If you are making this for someone that might be sceptical just call it chocolate frosting – they won’t guess from the taste its avocado. Avocados have so many health benefits from the heart healthy fats, to vitamins and fibre. Did you know that having an avocado with a salad helps to absorb more nutrients – even more of a reason to enjoy avocados with every meal! Peel the sweet potatoes and cut into thick slices. Aim to get about 6-8 slices per potato. Bake the potatoes for 30 mins at 450 F / 230 C. Turn half way through. 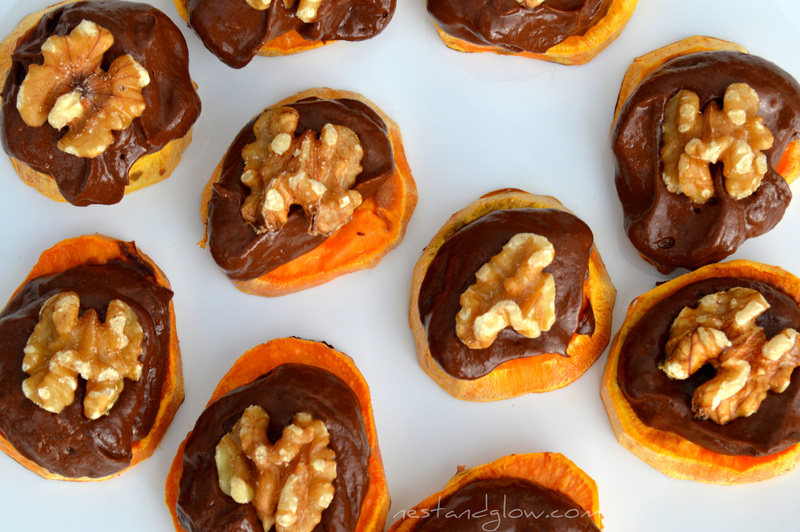 Spoon on the chocolate avocado onto the sweet potato bites and finish with a pecan or walnut on top. 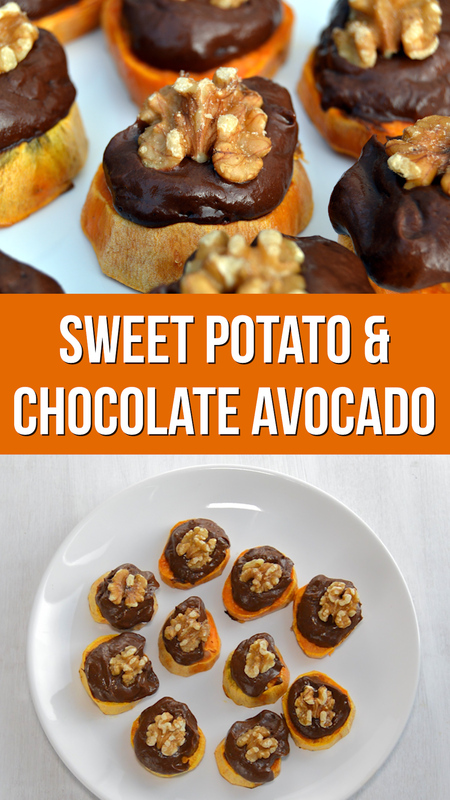 Enjoy the chocolate avocado sweet potato treats as soon as they are ready or store in the fridge for 2-3 days. If you like this recipe check out my ultimate healthy chocolate brownies with chocolate avocado frosting. They’re free of gluten, nuts and oil!